It´s a victory. The unknown triumphes. The people said „NO“. Without knowing what that exactly means and what it will bring tomorrow. But they clearly know, what it means for them: They are fed up with this life and the memoranda. People are angry about the arrogance of power, of the authoritarian governance of the European institutions and their discourse mill. They are done with all of that. The New is the majority. The old system of the corrupt two party parliamentarism stood all in one for the YES. The „NO“ was articulated also against that. The elites of yesterday continue to be the enemy, which the majority rejects to have a comeback – obviously without stopping at nothing. The political caste, the private media, the church, the old parties: their campaign and their promises only reach a minority today. The poor and the still existing proletariat said „NO“. In some of Athen’s neighborhoods even with up to 80%. People trust Tsipras, because he stands for the New and he’s their represantative – albeit they don´t know what Syriza can achieve, people trust in Syriza, even without having voted for Syriza. The big OXI has already become an inheritance for the radical left and the social movements. It incorporates the biggest possible antagonism in Europe since the carnation revolution of 1974. The Oxi will remain. It has to universalize – in Europe and beyond Europe. The Oxi’s semantics corresponds with the current level of struggles: The New is still to uncover. But fear has been conquered. Something’s gotta give. The Oxi was only imagenable, because there was a movement carrying a representation and a representation carrying a movement. A possible starting point of a new born Unidad Popular? The Oxi is a clear No to any »Right on!«. Therewith the movement, the Demos renewed its position. Syriza will be oblidged to answer it. If the government tries to read the no as a yes, they will disappear. The victory´s celebration will take place in the streets of course. But Today, it will also take place in the goverment´s building (Maximou). Of course, tomorrow negociations start again. What else? 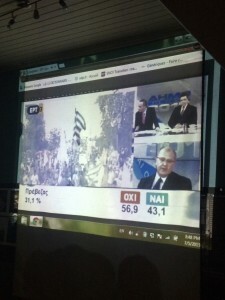 But at the same time, from tomorrow on, the campaign of the European Oxi! starts. A spectre is hauting europe!